Italian Wedding Soup has nothing to do with weddings but it is a marvelous marriage of vegetables and meats that make up this hearty soup. It’s made with a clear chicken broth and usually with spinach, escarole, cabbage, shredded chicken, sausage or meatballs. Occasionally pastas like pastini or cavatelli are added. I prefer little pork meatballs with this soup. It is so flavorful when the meat is poached directly in the broth. The other ingredients are truly a matter of taste. I use fresh spinach, carrots, celery and the shredded chicken along with around a half a cup of pastini. Usually it’s just a broth but I like the texture and flavor of pastas in my soups. Also you can use either home made broth for this soup or if you don’t have the time canned broth will work just fine. 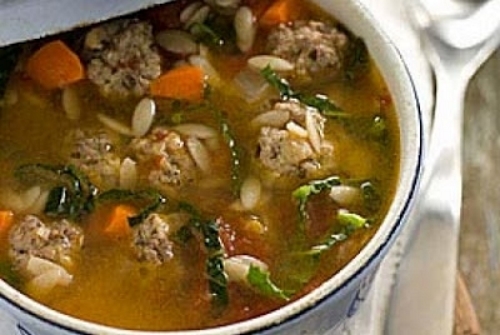 This Italian Wedding Soup is perfect any day of the week. Serve it by itself for dinner or as a first course before your main dish. Either way don’t forget to sprinkle the fresh grated Parmesan cheese all over the top before serving. In a large pot sauté the onions, carrots, celery and garlic in the olive oil and butter for 2 to 3 minutes. Add the chicken breasts and poach for about 10 to 15 minutes. Remove the chicken , shred and return to the broth. Add the spinach and parsley and simmer for around a 30 minutes. Add the meatballs and cook for 15 to 20 more minutes. In a large bowl combine all the ingredients together. Shape the meat into small 1 inch balls. Serve with Parmesan cheese. Serves 8 to 10 people.